We have this absolutely gorgeous Scarborough Renaissance Festival Pirate Lady Costume for the SRF Legends of the Sea, Pirate Weekend. We are the Headquarters for SCARBOROUGH RENAISSANCE FESTIVAL COSTUMES in the Dallas Area. 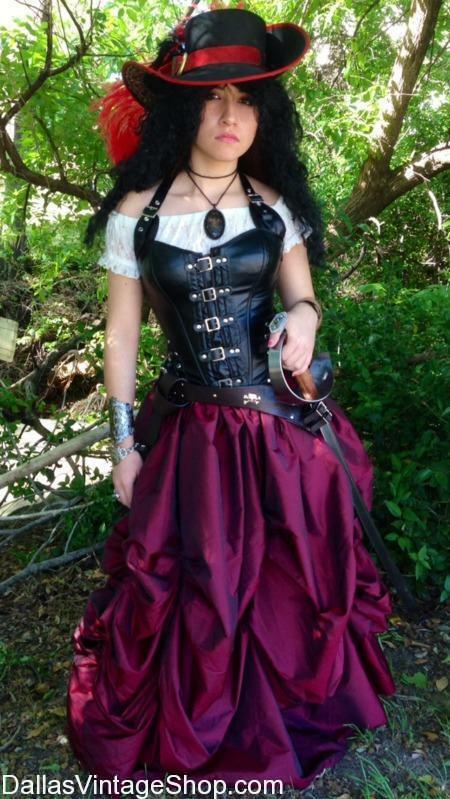 This Ladies Pirate Wench Corseted Costume is just one amazing outfit that awaits you at Dallas Vintage shop. Get Scarborough Renaissance Festival Pirate Weekend Costumes, SRF Legends of the Sea Pirate Weekend Ladies other Costumes, SRF Ladies Dresses, Blouses, Wigs & Corsets, SRF Supreme Quality or Economy Attire, Adult & Kids and Scarborough Renaissance Festival Costumes for Ladies & Men. We are open all year and we have an unbelievably huge selection of Renaissance or SRF Themed Weekend attire for everyone. This entry is filed under Scarborough Fair. You can follow any responses to this entry through the RSS 2.0 feed. Both comments and pings are currently closed.